Development plans prioritize rare sea creatures. Li Xing and Huang Chaohua report from Qinzhou. As the dolphins swam by and frolicked among the waves, cheers erupted from three nearby motorboats. The cameras flashed and clicked as the majestic creatures dived deeper in the shallows of Qinzhou's Sanniang Bay in the Guangxi Zhuang autonomous region, before darting, almost teasingly, away. 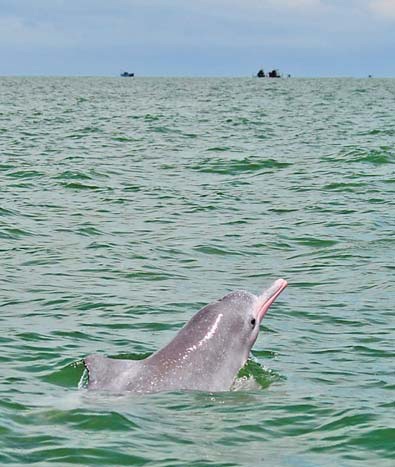 Although called humpback dolphins and categorized in marine biological terms as being part of the Sousa genus, those in Sanniang Bay are distinctive sub-species called Sousa chinensis, or the Chinese White Dolphin. Usually pinkish white, light or dark gray in color, the dolphins have conspicuous humps and low, slightly curved fins. The marine mammal, whose cousins live along the Chinese coast in the Pearl River Delta, Leizhou Peninsula in Guangdong province, Xiamen harbor in Fujian province and Taiwan island, is unique to China and listed in the State's top wildlife protection category. Who's right - the dolphin or the octopus? "It's not often you see so many of them gather together and get so intimate with each other," said Chen Mei, a doctoral student at Peking University, who is studying the impact of environmental changes on the natural habitat of the dolphin. While filming the dolphins playing and making notes, she looked up and frowned at the sight of several large fishing boats not too far away. "By local law, ships are not supposed to get so close to the area where the Chinese white dolphins live," said fisherman Huang Xiaode, 30, as he steered the motorboat towards a collection of bubbles made by the sea mammals. "We've seen a dolphin with a deep cut a few inches down his neck. A fishing boat cut him a few years ago." Still, over the years the gentle waters of Sanniang Bay have remained a relatively quiet sanctuary for the Chinese white dolphin. They have been least affected by economic development. However, Pan Wenshi, a professor who earned international acclaim for his research on giant pandas and their natural habitat in the Qinling Mountains of Shaanxi province, is worried. "The whole area is on track for rapid industrialization in the coming years," he told China Daily in an exclusive interview, adding that he believes Qinzhou could be transformed into another Shenzhen, a major industrial hub in neighboring Guangdong. 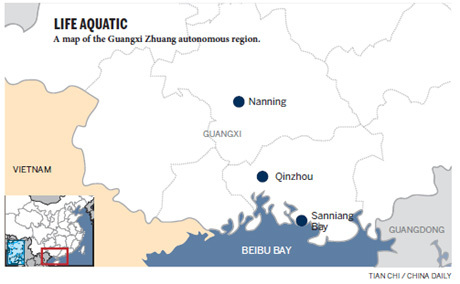 This year, the Guangxi government officially unveiled plans to develop Sanniang Bay into a marine and ecology tourism zone. Its development is an integral part of the Pan-Beibu Gulf Economic Zone mapped out by a national plan released two years ago. The goal is to turn the area into a new growth engine for the country. Under the national plan, Pan-Beibu Gulf Economic Zone will include a new industrial base with ports, oil refineries, iron and steel and petrochemicals plants, paper mills and other facilities. Qinzhou's 2010 development plan, which was adopted in March during the annual session of the local people's congress, also stipulates eight ambitious priorities for the city. It includes construction of a core industrial zone, international port, transport hub and logistics center for trade between China and members of the Association of Southeast Asian Nations. The plan also aims to turn the city into an international tourist destination that is livable and suitable for business. To accomplish the goals, officials are going all-out to attract investment and increase its soft power by promoting cultural projects. Since March, authorities have injected 30.6 billion yuan ($4.4 billion) to kick-start 84 new projects and continue construction on 186 others.